The warm photo of child actors Lee Min Ho and Lim Si Wan together with Song Jae Rim in MBC sageuk The Moon that Embraces the Sun directed by Lee Sung Jun and Kim Do Hoon has been made public. 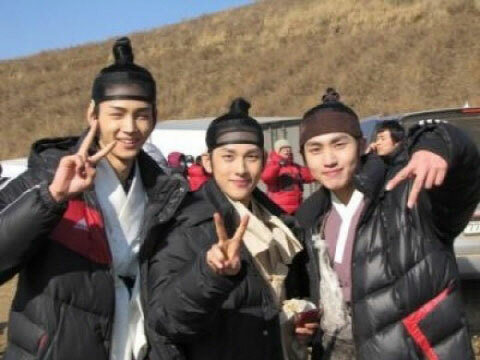 In the published photo, young Prince Yang Myung (Lee Min Ho), young Yeom (Lim Siwan) and Woon (Song Jae Rim), the three persons were affectionately posing a V sign with smile on the face despite the cold weather. Netizens commented, “Already over? Please extend it!” “All is flowery handsome boys,” “Today I will defend to to the last in my room,” and etc.